Hamilton board member recognized at top level - Hamilton School District. Hamilton School Board Member Deborah Briggs was honored Oct. 20 at the Wisconsin Association of School Boards (WASB) regional meeting for reaching the highest level in the WASB Member Recognition Program. 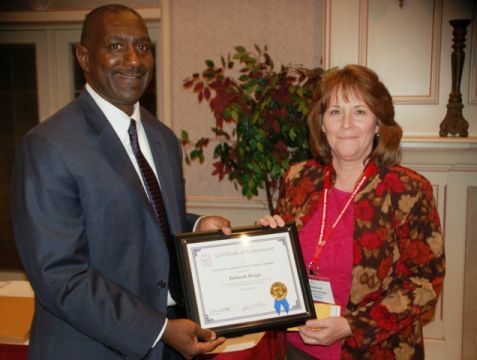 Briggs received the award from WASB Executive Director John Ashley. The WASB Member Recognition Program honors board members that attend a high number of WASB meetings and events and other professional development opportunities. Briggs has been a member of the Hamilton School Board since December, 1993.